Negative ions are abundant in wooded areas, beaches or near flowing cascades. These ions lift our spirits and increase our sense of well-being. Unfortunately, they are depleted by air conditioning and heating systems, but you can bring them back by diffusing essential oils with an electric pump. 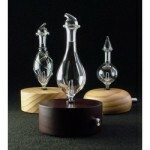 The air is blown into a glass nebulizer that produces a mist of very tiny droplets (micro particles) of essential oil. The fineness of the mist gives the droplets the ability to remain suspended in the air and benefits the aromas diffused. It allows everybody to freely inhale them. The mist is revitalizing, deodorizing, and fights bacteria/fungus, but the quality of the glass is crucial and must produce a very fine mist. Our glass diffusers can help in reducing respiratory difficulties in a natural way if you use the appropriate essential oils. They are useful at home, office, shop, or salon and highly recommended for medical offices, hospitals, and massage rooms. The quality of the glass is crucial and must produce a very fine mist. They are beneficial to the patient and the therapist. Always be aware of the quality of the oils you diffuse, as you can breathe harmful chemicals from the synthetic ones. To avoid becoming intoxicated, never use pure oils like Cinnamon, Arborvitae, Sage or Tansy. Instead, diffuse pure Lavender or Rosemary or use our blends like Abundance, Appreciation, Beam of Light, Breathing, Calming, Clear, Children of the Sun, Amaterasu, Archangel Michael/Metatron, Energy, Gratitude, Joy, Love, Mold out, Pachamama, Protection, Sleep Well, Spells Out, Stress Out, White Pine, Violet Flame & Yellow Ray. HOW TO USE – Gently insert the glass nebulizer into the rubber ring. Simply take out the glass cap, pour 15 – 20 drops into the glass cylinder and turn on & no more than 10ml. With the dark wood base, the time will shut automatically. With the light base, you will have to turn it on manually. But you can never ruin your diffuser if you let it run as the electricity will continue blowing air into the glass part, but not affect it negatively. But DO NOT use blends with St. John’s Wort or pure Frankincense, Nard, Patchouli or Ylang-Ylang as it will clog your diffuser. It comes with or without internal timer ($104 and $94 without). To CLEAN the nebulizer, it is very fragile; diffuse some Balsam Fir, or 91% rubbing alcohol for a few minutes. Then discard the alcohol.